Infrastructure is one of those odd topics where it's hard to find anyone who takes a strong stand against it, but as a government and a society we never quite get around to doing it. The Council of Economic Advisers, in its 2016 Economic Report of the President, devotes a chapter to explicating the issues. 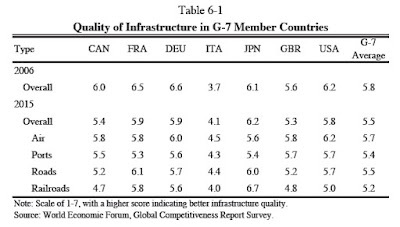 The overall tone of the chapter leans strongly in the direction of more infrastructure spending, but I was intrigued by some evidence that the condition of US infrastructure may not be as awful as I had expected, as well by implications of the alternative justifications for infrastructure spending. 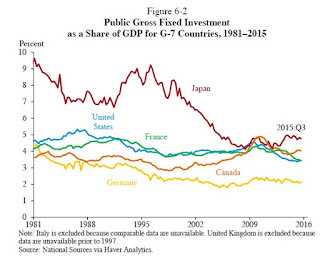 When it comes to overall public "gross fixed investment," the US looks pretty similar to France and Canada, and in recent years to Japan as well, with all of these countries running ahead of Germany. Of course, the case for infrastructure investment should be rooted in analysis of costs and benefits. 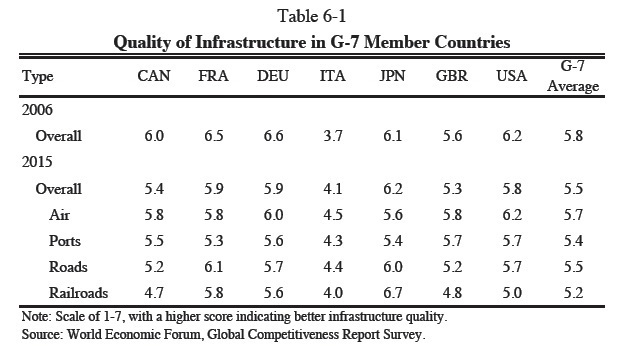 Four kinds of benefits for infrastructure investment are mentioned in the report: 1) it can boost demand in the short-term when an economy is in recession; 2) it can reduce congestion; 3) it can reduce maintenance costs; 4) it can complement the private economy in ways that add to long-term productivity growth. These justifications have different implications, so I'll say a few words about each. The case for infrastructure spending to boost demand in a recession is of course a lot more powerful when the unemployment rate is 10% (as in October 2009) rather than when it is 4.9% (as in January and February of this year). There are also some practical problems with using infrastructure spending in this way, because it needs to ramp up quickly while the effects of the recession are still occurring. For those who want more on this topic, a starting point is "Thoughts on Shovel-Ready Infrastructure" (October 15, 2015). 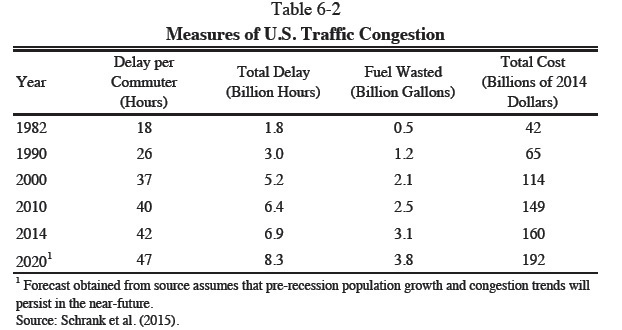 Traffic congestion is a real and severe problem. 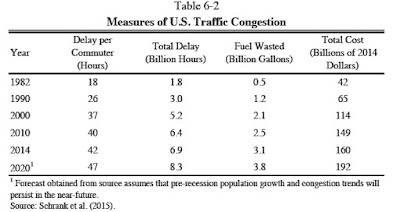 The average US commuter spends about 40 hours per year in traffic delays, which is not only a loss of time equivalent to a full work-week, but also involves wastes of fuel and pollution. That noted, it's very difficult to build one's way out of traffic congestion. Sure, many cities have some poorly designed interchanges or other bottlenecks where building anew would help. But the broader problem, as Anthony Downs pointed out in his 1992 book Stuck in Traffic, is that three kinds of substitution occur when rush-hour traffic gets bad on the highway: people adjust the times that they travel, people shift to different and less congested routes, and people shift to alternative modes of transportation (like mass transit). But when additional lanes are added to a freeway, this substitution works in reverse. As some commuters are attracted by the additional traffic lanes to shift back from the other times they were travelling, or to shift back from the alternative routes, or to shift back from the alternative modes of transportation, building more highways ends up not having much effect on congestion. Ultimately, the way out of traffic congestion involves some combination of "congestion pricing," which means charging drivers for being on the road at peak times, or the future of driverless cars. These steps involve specific kinds of infrastructure spending, but just fixing up the existing roads and bridges, or adding some traffic lanes, isn't likely to make much of a dent in congestion. A rising share of infrastructure spending has been going to maintenance and operations, rather than to new infrastructure. This trend makes sense. For example, back in the 1950s and 1960s the main focus was on building the interstate highway system, but now there will be a greater emphasis on maintaining it. But here's the pattern. Infrastructure spending that takes the form of maintenance can pay for itself, both by reducing future repair costs and also, for example, by reducing wear and tear on vehicles. "One estimate is that every $1 spent on preventive pavement maintenance reduces future repair costs by $4 to $10 (Baladi et al. 2002). Transportation engineers have developed economic methods that determine the optimal timing for applying preventive maintenance treatments to flexible and rigid pavements by assessing the benefits and costs for each year the treatment could be applied (Peshkin, Hoerner, and Zimmerman 2004). Allowing the condition of transportation infrastructure to deteriorate exacerbates wear and tear on vehicles. Cars and trucks that drive more frequently on substandard roads will require tire changes or other repairs more often—estimated to cost each driver, on average, an additional $516 annually in vehicle maintenance (TRIP 2015). Delaying maintenance can also induce more accidents on transit systems. Not repaving a road, replacing a rail, reinforcing a bridge, or restoring a runway can result in increased vehicle crashes that can disrupt transportation flows and create substantial safety hazards." However, there's not a lot reason to think that infrastructure focused on maintenance will have the same effects on helping to improve economic productivity as, say, the original infrastructure investments in railroads, seaports, highways, and airports. One of my quibbles with this chapter is the amount of emphasis that it puts on transportation infrastructure. 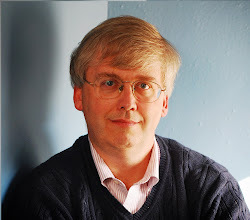 While additional investments in transportation can be justified for the reasons just given, it's also true that government tends to spread out the transportation money so that it covers a lot of Congressional districts, rather than being focused on the biggest needs, and also that it tends to prioritize new roads when maintenance may be more important. Here's the Congressional Budget Office in its February 2016 report Approaches to Make Federal Highway Spending More Productive. For example, even though highway travel is more concentrated on Interstates and in urban areas, and urban roads are typically in poorer condition than rural ones, the federal government and state governments typically have spent more per mile of travel for major repairs on rural roads. Moreover, the extent to which new highways boost economic activity has generally declined over time, increasing the importance of maintaining existing capacity. Yet spending has not shifted much accordingly. 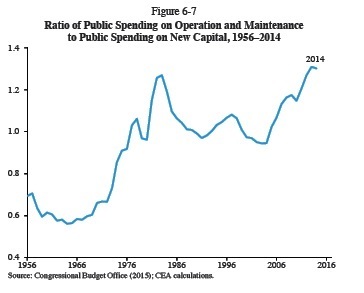 For detailed graphs and numbers on these issues, the March 2016 CBO report on "Public Spending on Transportation and Water Infrastructure, 1956 to 2014" is also useful. 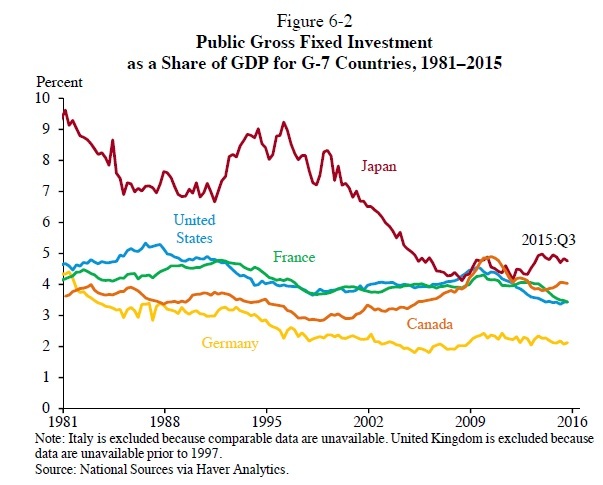 "Some research found that increasing aggregate public investment by $1 can increase long-term private investment by $0.64 (Pereira 2001). However, this effect was found to vary noticeably among different types of infrastructure: Pereira (2001) estimated that publicly investing $1 in electric and gas facilities, transit systems, and airfields induces a $2.38 rise in long-term private investment, whereas an additional $1 of public investment in highways and streets increases private capital investment by only $0.11." A policy agenda for updating the communications and energy infrastructure is more difficult, because it involves thinking about infrastructure that is owned by private companies and because it opens up broader questions, like choices about energy policy choices and the security of communications. I'm fine with also updating and maintaining roads and bridges. But those kinds of road-based infrastructure investments aren't likely to be main drivers of 21st century American economic growth.